You may not recognize Schuyler County by its official name, but we bet you’ve heard of Watkins Glen. 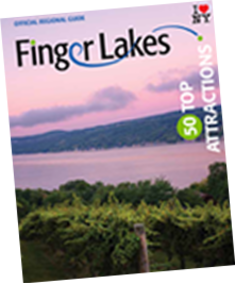 Located in the southern part of the Finger Lakes Region, the town is famous for its state park, which is home 19 waterfalls situated along a beautiful two-mile gorge trail. Voted the #3 State Park in the country, it’s a must-see for anyone traveling to the region. But Watkins Glen State Park is not all that Schuyler County is famous for. It’s also well known for Watkins Glen International, a world-renowned road course that hosts pros from NASCAR, IMSA, Vintage Cups and more. Travel in for an event or hit the speedway yourself – the track is open to the public to drive your own vehicle around the Grand Prix circuit, behind a pace vehicle. And don’t miss the International Motor Racing Research Center, also in Watkins Glen, to learn more about the world of road racing and the story behind the speed! Once you’ve taken in the falls and satisfied your need for speed, the fun continues on the water, in the forest, or even on the farm! Take a cruise on Seneca Lake and enjoy sightseeing or eco-history tours, a sunset sail and more along the deepest of our Finger Lakes. Walk along a trail at Finger Lakes National Forest or saddle up and take a guided trail ride on horseback with Painted Bar Stables. Cuddle up to sheep, cows, pigs, goats, horses and more at Farm Sanctuary, or stay the night in one of their cabins or tiny houses. Seneca Lake is also home to the Seneca Lake Wine Trail, with over 30 member wineries to sip, savor, and enjoy. The natural beauty of the area is sure to wow you – no matter what you choose.